So Warren Buffet says whenever you see a herd running in one direction, you are supposed to walk the other way. Well the re IS a stampede in Virginia trying to buy homes in time for the Obama tax credit. People LOVE tax credits. Kinda like people love to “SAVE” by going FSBO, when it will likely actually NET them less. Has anybody stopped to wonder whether this mad dash might be temporarily INFLATING prices beyond the credit that it offers? And the day after the credit expires, might there be stall? Winters are bad enough, maybe the worst winter recorded? If you are buying under the $100,000 price point, sure that $8k credit will likely be better to take now. If you are buying from $400k-$700k, you have to ask yourself, “Once the flood of buyers evaporates, won’t that send prices down?” Maybe. Am I saying “DO NOT BUY?” No, but I am also saying, don’t be silly and getting into some crazy bidding war or overpay for a place to get in under the wire. Kinda like the Cash For Clunkers campaign. How many “Deals” do you think the dealers were really giving in that last week when their phones were ringing off the hook? They probably jacked prices up. And sometimes that $5,000 credit was in place of a $3,000 valued car. So the net saving was only $2,000! And on a $20,000 car, I bet a month after the tax credit, (after inventory catches up) you can get that $20k car for well under $18k. Don’t get too greedy! You also want to sell into this flurry. Ask for too much and watch the dead Winter-time come (unless Congress extends it, which they might). Normally I am not an advocate of Market Timing. But for those that like to try and play the game, I just wanted to give you some food for thought. Also please attach comments with links to any other blogs that might question the value of rushing in to get the tax credit (I didn’t see any, they were all “buy now”). And stay tuned for a flurry of new posts. I had an 18 hour trip to Africa (see Wheel Estate Cam Below) to write a ton. Great post! I didn’t notice any typos. Really enjoyed the video, like a Wheel Estate Animal Planet documentary. In my local market, which is the Fort Lauderdale/Miami area, the multiple offer frenzy really started back in March when this was announced. It was picking up a little after the first of 2009 but this tax credit was announced. So it would seem that if this expires at the end of November that the market might take a little breather. Actually I spend most of my time working with buyers so I would appreciate a better chance at getting them under contract! We’ve been talking about it ad nauseum in the Nova Bubble Fallout Blog. So much so that it’s just short hand, we call it the $8k buyer’s bribe. Guess you’ve been too busy with the buying frenzy to blog lately. It’s been a frenzied summer. But given the closing deadline things are already starting to slow down. Vienna slowed about a month ago, Burke is just starting to slow now. It all depends on how close to $400k the entry level market is in a given area. If starter places are under $400k (vaguely affordable to the income cap of $150k for couples for the $8k incentive) then the market stayed in its seasonal rush for longer. There could be further frenzy now, as the inventory declines (seasonally) and those last few people trying to take advantage but out-bid all summer try to buy. But I doubt it will be as much of an effect as already happened this summer. The mini-bubble already happened. Prices for TH’s and condos in Burke were $15k-$20k over what they were last summer (partly due to interest rates a full point lower). However, unlike the limited time cash-for-clunkers, the $8k FTHB credit was something people could plan for, so the rush probably already happened, as people prefer to move in the summer. What both really do is pull future demand forward. Those who might have waited another year to save up more money for moving expenses etc, bought this year instead. So even if it’s extended, the stimulative effect will taper off, because you’re just time-shifting when everyone buys. If however, they let it expire, that will create a gap in demand, which could be a fabulous time to buy if there’s any inventory worth buying in the dead of winter (there’s always something, and there may be enough SS’s and REO’s still trickling out). I think Congress will be watching September car sales closely to help them decide what to do about the $8k. Calculated Risk would be the other place that has discussed this in depth. CR hasn’t actually seen a price increase, but he’s looking at a national level. Hey Cara, Thanks for your input. I haven’t been following the Nova Bubble Fallout Blog. As for my main blog, yep, been slow, but I have a flurry coming up soon. Already typed out and all. There are barely three months left before the $8,000 tax credit for first-time buyers ends — and it can take that long to close on your new home. Welcome back Frank! I almost gave up on your blog until I saw this post. I’m a relatively new homeowner in Ballston (4/08) and I really enjoy your posts (I suffer from analysis paralysis). 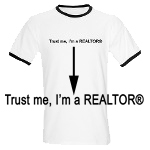 Most Realtors I know are unfailingly optimistic and skirt the negatives of the market while you seem to tell it like it is. I like that. I also saw one of your listings a few months back. Your presentation is phenomenal. When it’s time for me to sell you’ll be the first one I call. Now for some criticism: I HATE the Wheel Estate Cam. Can you please stick that thing to the dash or something. Whenever you turn I get nauseaus.